How is Alimony and Spousal Support Determined? Many times “alimony” and “spousal support” are used synonymously; however they are different legal issues. Both financial arrangements are attempts to balance any unfair economic consequences that were caused by the divorce. Alimony is a legal responsibility of one spouse to give financial support to the other spouse. This support is possible before or after the couple is separated or divorced. • Temporary alimony (alimony pendente lite) is financial assistance ordered when the couple is not living together, and the divorce is pending. 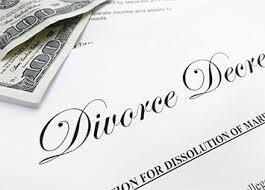 • Rehabilitative alimony is granted, for a specified period, to the spouse who earns less money. That person is given time and financial support to obtain the job skills needed to enter or re-enter the workforce and become self-sufficient. • Permanent alimony gets paid to the spouse who earns less money until that spouse dies or remarries or the spouse paying the alimony is deceased. • Reimbursement alimony is repayment by one spouse to the other spouse for certain expenditures during the marriage, such as school tuition. A fifth type of payment recognized by most state courts is “Lump-sum Alimony.” If one spouse does not want anything of value from the marriage, the judge has the option to order a one-time lump-sum monetary amount instead of property. • The length of the marriage. If the couple has not been married long and there are no children, the court may opt not to award alimony. If there are children younger than school age, the court will probably award alimony to the parent who has custody of the children. • The ability to pay. The court examines the gross income of the marriage and subtracts the mandatory deductions, like income taxes. The remaining net amount decides the capacity to pay alimony. Voluntary debts, like union dues, are not considered. • The incomes of both ex-spouses. What the couple currently earns and their individual earning potential are court considerations. If a spouse has not worked during the marriage, but can be self-supporting, rehabilitative alimony is often granted. • Marital indebtedness. If the court orders one spouse to pay the bulk of the debts, it usually reduces the amount of alimony that spouse will be required to pay. Temporary spousal support, or spouse maintenance, are payments that can be requested by a spouse before filing for divorce if the couple does not live together. In some states physical separation and legal separation are not the same, and some states, don’t recognize legal separation. You may want to find out about the laws where you live.